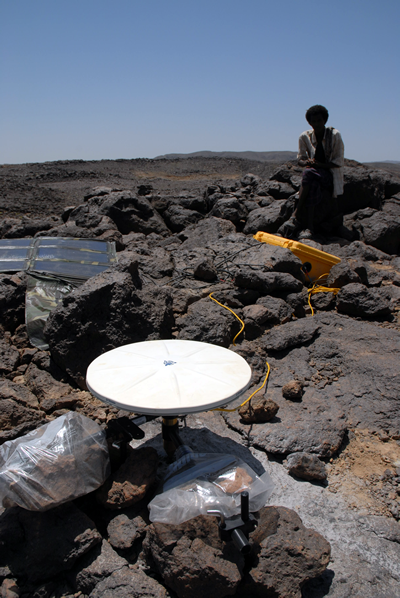 A major seismo-magmatic event in the Afar region of Ethiopia in October of 2005 prompted installation of 10 continuous GPS stations around the rift in January of 2006 by scientists from Purdue University, Lamont-Doherty Observatory, and University of Rochester in the U.S., in collaboration with the Geophysical Observatory of the Addis Ababa University in Ethiopia and the University of Leeds in the U.K. This network was serviced and supplemented in March 2007 with installation of an additional 7 continuous sites and the establishment and measurement of a 30s-ite campaign GPS network in Afar. Participants in the field included personnel from Purdue University, Leeds University, UNAVCO, and the Ethiopian Mapping Agency. The GPS work accompanied the installation of seismometers by personnel from University of Rochester, Leeds University, Royal Holloway University, and Addis Ababa University. The Afar region experienced increased seismicity and and fissural volcanic eruption in September 2005, accompanied by the intrusion of an approximately 60 km long dyke with up to 8 meter opening. There have been at least 5 diking events since that first event, recognized in the seismicity and in InSAR data. This geodetic network will provide an unprecedented opportunity to directly observe and quantify diking and post-diking processes related to oceanic rifting. Equipment and essential technical support was provided by the UNAVCO Facility. More information can be found here on the PI's web site. More information about the Dabbahu volcano eruption. Figure 1 Local resident Mohamed Sahele guards station KM74 on the campaign GPS transect east of the rift zone.